Jack might be gorgeous but Stella isn’t in the market for a man, especially one who hates her. No matter how attractive he finds her Stella is the very last person Jack should want. The trouble is, they’re all alone and the chemistry is irresistible, and, well, what happens in Scotland stays in Scotland, right? His Best Mistake is the story of Stella, a courtroom artist and Jack, a currency trader. Stella is nursing a broken heart and has taken to her cottage in the Highlands to get over a broken heart and learning that she’d played the role of the Other Woman. She was painting away her pain when a strange vehicle drove by her property and ended up in an accident. The driver was gorgeous and gruff, and it turns out, the brother of her former flame’s fiancée. He showed up to read her the riot act, and Lucy King did a good job of making him a first glass jerk from the beginning. Too bad for Stella, he didn’t stay a jerk. After waking up to an empty bed after a night of spectacular loving, Stella feels both disappointed and relieved. At least until a few weeks later when she gets the shock of her life. Lucy King made this story enjoyable by switching up the roles a bit. Though Stella did have self-esteem issues, she was the strong one in this story. The one who tried to make herself better and do better while Jack was stuck in a rut of mourning and misery. 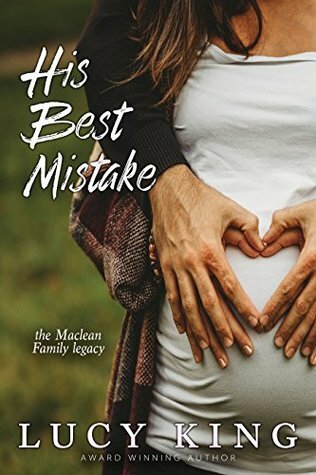 His Best Mistake should have been a depressing read and at times it was mighty frustrating, but overall this was a fascinating story about getting what you want when you least expect it. There were plenty of times I just wanted Stella to throw her arms up and kick Jack to the curb, because he really was pretty bad for most of the story. He mourned, and felt guilty in those rare moments that he actually gave a damn about the woman in his life today, and after a while I just found it hard to have any sympathy for him. At first I was worried that Stella would be a doormat because of how easily she gave in to some of his demands—even though she had a valid reason for doing so—but it turned out that she was determined to feel more confident, to be better and do better. That’s an admirable trait in any woman but especially for a mom to be. If I could fix anything other than Jack in His Best Mistake, it would be the cover. Not to get all nit-picky but it gives away the plot which takes that surprise away pretty quickly and there wasn’t much drama otherwise. This entry was posted in New Releases, Romance and tagged billionaire romance, British romance, contemporary romance, contemporary romance book reviews, kindle pregnancy romance, widower romance on January 2018 by writinstuff.